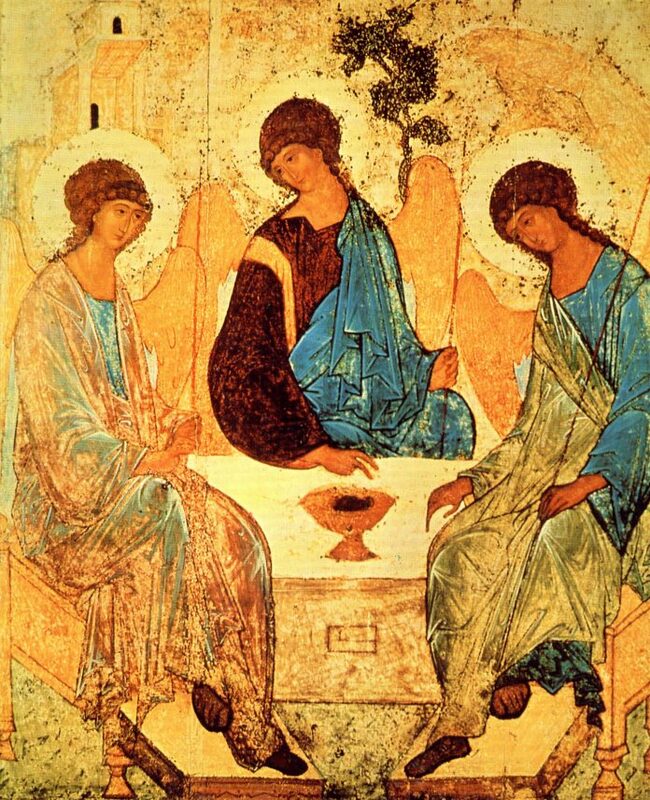 The icon of Holy Trinity painted by Andrei Rublev remains until today one of the landmarks of the Orthodox iconoghaphy. Whether it’s about starting a family, a new job, a special event in our lives, or we just want to make someone a gift, buying an icon is always a special event. The icon expresses, through its contours and colors, great theological teachings, which the Church has condensed in the symbols that give the Orthodox icons a special beauty coming from another world. However, today, more than ever, we encounter an abundance of graphic representations that claim to be authentic icons and which can make us believe that we are buying an “icon”, when, in fact, they are just profane images. Therefore, I put together six criteria to help us recognize the true Orthodox icons! This is the handiest criterion by which we can distinguish between an authentic icon and a simple painting. The great painters of Orthodox icons realized that the value of their work did not come from their talent and work, but from God, inspiring them and guiding them during painting. Even if we are talking about a man’s co-operation with God, the Orthodox iconographer was aware that the icon he was painting did not belong to him entirely, but most of the creative process was due to divine intervention. That is why, for Orthodox Christians, a true icon is, first of all, the work of God and, thereafter, the creation of man. Consequently, the painter has no right to claim ownership of this graphic representation, because he believes that it belongs entirely to God to whom he lent his hands and talent. Unlike this, for an ordinary painter, it is absolutely normal to sign his work, because through this gesture he recognizes that the artistic production belongs entirely to him. Therefore, when such a painter creates a Christian-themed drawing and signs it, he recognizes that the work belongs only to him, not to God, and we cannot speak of an icon. There are still some disputes between the theologians about this because some scholars argue that when the name of the person in the icon is written, it becomes obvious that we can no longer speak of an ordinary drawing, but of a holy representation. If we take into account that the icon is the result of the collaboration between God and man, we would be inclined to agree with this point of view. But in its wisdom, the Church decided that the icon should be sanctified through a special ceremony. Why? Because the sanctification of one thing means it is consecrated or dedicated to God in its entirety. Basically, any sanctified object is removed from ordinary use and intended to be used only within the Christian rites and ceremonies. Under these circumstances, any religious representation of a religious theme can only be considered as an icon when it is fully consecrated to man’s connection with the Divinity, and this is accomplished by sprinkling with sanctified water following a special prayer. So, if you are not convinced that the icon you have purchased is sanctified, then you have to talk to a priest to sanctify it. Another defining feature of Orthodox icons is given by the appearance of the saints. The face, hands, and body have that spiritualized note that they do not resemble much to the faces of ordinary people. It is the way Orthodox iconography expresses a fundamental truth of faith. Through their ascetic life, by the restraint of their thoughts and by their love accompanied by continual prayer, the saints no longer belong to this world, even if they live in our midst. Therefore, when you see “icons” in which the people are rendered with red cheeks and voluptuous shapes, you must know that you don’t stand in front of an authentic icon. So, the paintings with angels depicted as chubby children flying playfully among the clouds must be considered … simple drawings. This is due to the fact that they cannot even stimulate you to meditate or induce a praying state. In the vision of icon painters, nothing should be left to chance. This explains why the great iconographs are very profound theologians. Only their form of expression differs. Instead of using words, they chose the colors, points, and lines. Therefore, strict rules were needed, so that the teachings of faith transmitted by the icons would not be distorted. And later, there were also handbooks or manuals for icon painters. The most famous book of this kind is the “Painter’s Manual” of Dionysios of Fourna, which was written in the early part of the eighteenth century. Here, we are told what each icon should contain and what icons should be found in a church, as well as their position on the walls of the edifice. However, we must remember that these rules were not established by Dionysios of Fourna. He only wrote them down. The principles of icon painting had already been established since the first Christian millennium and have remained unchanged since then and have been passed from masters to disciples over the centuries. For those who want to know more about the secrets of Orthodox icons, I recommend, besides Dionysios of Fourna’s “Painter’s Manual” (Buy it on Amazon), Michel Quenot’s very accessible book, “The Icon, a window on the Kingdom” (Buy it on Amazon), explaining the evolution and symbolism of Orthodox icons. Here, he explains the meanings of the colors in the icons. Thus, in the Orthodox iconography, there are mainly seven basic colors: white and black, blue, red and yellow, green and brown. And each of them has a distinct significance that was established hundreds of years ago. Michel Quenot tells us that blue is the color of Divinity, while red is considered an imperial color that expresses both life (blood, wine) and the flames that devour sinners (shades of red washed). 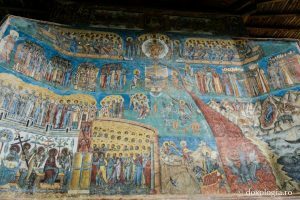 The Final Judgement represented on the Western wall of the church from Voroneţ Monastery expresses a metaphorical vision of Heaven and Hades. Unfortunately, many Christians didn’t understand this kind of theological expression. 2) Gold as the color of coins (cloudy or pale yellow) that leads to corruption and decadence. In turn, green is the expression of rebirth and renewal (vegetation), while brown is the color with which human skin is rendered. The explanation is found at the moment of creation when the Bible tells us that man was created from the dust of the ground through the direct work of God, and that brown is the color closest to the hue of the ground. Last but not least, the two non-colors, white and black, have special also meanings. As expected, white symbolizes light, purity, infinite knowledge of God, and leads us to joy and happiness. 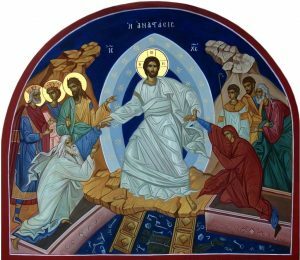 In the Resurrection icon, our Lord Jesus Christ has His clothes of white color which signifies the light, the happiness, and the eternal life. In contrast, black is the color that absorbs light without giving it back. From this perspective, it represents the night, the anxiety and the death. However, in Orthodox iconography, black is not considered a pessimistic color, because the darkness of the night announces the light of the sunrise. This explains why the clothes of the great hermits are black, as black also means giving up this fleeting world with the intention of seeing the divine light. The conclusion is very simple: you should pay great attention to the colors of the icon you want to buy. They say more than they seem at first glance. Therefore, purple, orange or other colors used in excess do not find their place in authentic icons. And that’s because the icons do not want to shock or draw attention to them. On the contrary, they intend, through the harmony of colors, to induce a state of tranquility, to give us the peace of mind. It is a common-sense principle, but I feel the need to insist on this. Orthodox icons must be painted in an atmosphere of fasting and prayer. Tradition says that, before painting the hands and the faces of the saints, the icon painters of old would fast harshly for three days before they started working. Indeed, there is a great difference between those masters and some so-called painters of icons. Therefore, when you wish to commission an icon, it is recommended to ask beforehand about the person who is going to do it for you. If, when you meet, she or he smokes, is drunk or wears clothes with “rebellious” drawings on them, it is advisable to look for someone else. This is not discrimination, and it has a very simple explanation. If the icon is the result of man’s co-operation with God, how can a man enter into the necessary state of receiving divine grace, if he does not take this seriously? Because they are born out of prayer and are painted in the atmosphere of prayer, the icons, in their turn, predispose to prayer. The colors that urge you to meditate, the spiritualized faces of the saints, the long shapes of their bodies, and plenty of theological symbols all help us to detach for a few moments of this world. In the end, they give us the opportunity to detach for a few moments of this world and focus more on the spiritual dimension of our beings. Sometimes, when we pray in front of the icons, we might have the impression that we are entering into dialogue with the holy persons represented on them. This doesn’t happen by chance! 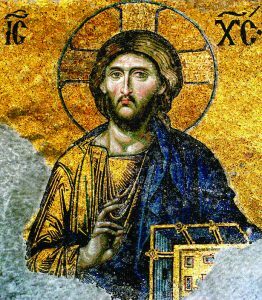 Even if Christ is looking up front, His face is orientated somehow on diagonal, in order to give the impression that He is speaking to us. It is the famous Byzantine “3/4 perspective”. This is how the icons are designed. It is the reason why the saints are rendered somehow on diagonal, the renowned ¾ perspective, precisely to emphasize the idea that they are living people who live and communicate with us. Consequently, when you are in front of an object with religious drawings, it is good to look at it more carefully before considering it as an icon. If that “icon” has a clock as an accessory or the colors and drawings change when viewed from different angles, most likely, we are not in front of an icon. As you can see, buying an icon should not consist of a simple visit to a church shop, or of accessing a website or a simple order given to a painter. This requires an analysis of our thoughts, a certain state of mind, and the understanding of the meaning of the icon we want. Orthodox iconography has evolved over time and has refined the rules of creating an icon so that nothing is left to chance. And if we take into account the purpose for which it is painted, we realize that it is normal to be so. Orthodox icons are not just works of art. They are so much more. That’s why the honor we give to an icon should start right from the moment we think of getting it into our lives! Sprinkling cross fashion the Icon with Holy Water the priest says: ”Hallowed and blessed is this Icon of St. (Name) by the Grace of the Holy Spirit, through the sprinkling of Holy Water: in the Name of the Father, and of the Son and of the Holy Spirit: Amen”. Pr. prof. dr. Ion Bria, Dicționar de teologie ortodoxă, second edition, Editura Institutului Biblic și de Misiune al Bisericii Ortodoxe Române, București, 1994, p. 197. Michel Quenot, The Icon: Window on the Kingdom, St. Vladimir’s Seminary Press, 1991. Next articlePsychotherapy or the Sacrament of Confession?